Leeds United Ladies have signed striker Ellen White from rivals Chelsea. 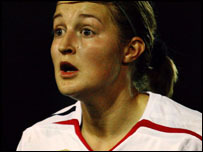 The England Under-19 international is the club's second summer signing after fellow forward Carla Cantrell. "I am really pleased to be joining a young talented team in Leeds. I feel it is now the right time to make the move," White told the club website. "I have ambitions and want to win things and Leeds have demonstrated that they have made great strides into starting to make a challenge." White added: "I thoroughly enjoyed my three seasons at Chelsea Ladies, which has significantly improved my development as a player both at club and international level. "I want to be part of team that win the National Premier League title and play in cup finals and firmly believe these opportunities will come along for me soon playing for Leeds." The striker hit a hat-trick against Poland in an Under-19s Uefa European Championships qualifier in April this year and has been the top scorer for Chelsea Ladies for the past three seasons. White has represented England at Under-17s, Under-19s, Under-20s and more recently Under-23s level. Leeds United Ladies manager Rick Passmore added: "I am delighted to have brought Ellen to the club for the forthcoming season. "It was no secret that we needed to strengthen our forward line, as we were so short on numbers in that area last season. "I believe we have now signed two of the most talented young strikers in the country in Ellen and Carla. "Not only was I impressed last season with Ellen's ability, but also when you witness her desire and motivation you know that you are bringing a player of quality to the club."